"A Prewar Slide Show Cast Iraq in Rosy Hues"
"'Delusional' Iraq plans envisaged only 5,000 troops by now, group says"
Washington D.C., February 14, 2007 - The U.S. Central Command's war plan for invading Iraq postulated in August 2002 that the U.S. would have only 5,000 troops left in Iraq as of December 2006, according to the Command's PowerPoint briefing slides, which were obtained through the Freedom of Information Act and are posted on the Web today by the National Security Archive (www.nsarchive.org). The PowerPoint slides, prepared by CentCom planners for Gen. Tommy Franks under code name POLO STEP, for briefings during 2002 for President Bush, the NSC, Defense Secretary Rumsfeld, the JCS, and Franks' commanders, refer to the "Phase IV" post-hostilities period as "UNKNOWN" and "months" in duration, but assume that U.S. forces would be almost completely "re-deployed" out of Iraq within 45 months of the invasion (i.e. December 2006). "Completely unrealistic assumptions about a post-Saddam Iraq permeate these war plans," said National Security Archive Executive Director Thomas Blanton. "First, they assumed that a provisional government would be in place by 'D-Day', then that the Iraqis would stay in their garrisons and be reliable partners, and finally that the post-hostilities phase would be a matter of mere 'months'. All of these were delusions." The PowerPoint slides reflect the continuous debate over the size of the invasion force that took place within the Bush administration. In late November 2001, President Bush asked Rumsfeld about the status of plans for war with Iraq. He asked for an updated approach, but did not want to attract attention. Rumsfeld ordered Gen. Franks to prepare a commander's estimate of improvements needed, and Franks convened a planning group that adopted the codeword POLO STEP. 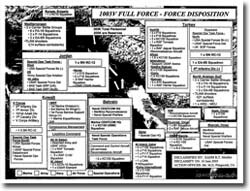 The slides in this Web posting are a compilation reflecting various iterations in war planning. The U.S. government maintains plans for conflict with a multitude of possible adversaries. 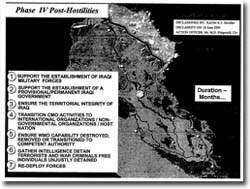 The contingency operating plan for Iraq--OPLAN 1003-98--had last been fully reviewed in 1996 and was updated in 1998. It envisioned an invasion force of more than 380,000 troops. Former CentCom commander Gen. Anthony Zinni (who saw gaps in the plan--particularly in regard to the post-war order) organized a war game--Desert Crossing--in 1999 to examine additional contingencies. Under pressure from Secretary Rumsfeld for a leaner force (according to accounts in books by Michael Gordon/Bernard Trainor, Thomas Ricks, and Bob Woodward), Zinni's successor, Gen. Franks, reduced the number to 275,000 in the commander's estimate he gave to President Bush on December 28, 2001. During the course of 2002 alternative versions of the plan were developed reflecting various assumptions about levels of allied support--"robust", "reduced", or "unilateral"--and about the amount of lead time available between the order to invade and the deployment of forces. Under the Generated Start option Bush would have provided CentCom with 30 days notice for war, and 60 days to deploy. Following Rumsfeld's mandate to reduce deployment time to prepare for any contingency, Franks developed the alternative Running Start option: conflict would begin with escalating Red, White, and Blue air strikes followed by ground war as troops were deployed. By mid-August 2002 a Hybrid concept had been developed--the U.S. military would quickly mobilize forces in the region, initiate an air strike campaign, then launch a ground invasion. "Bush, Cheney, Rumsfeld, and Tommy Franks spent most of their time and energy on the least demanding task - defeating Saddam's weakened conventional forces - and the least amount on the most demanding - rehabilitation of and security for the new Iraq. The result was a surprising contradiction. The United States did not have nearly enough troops to secure the hundreds of suspected WMD sites that had supposedly been identified in Iraq or to secure the nation's long, porous borders. Had the Iraqis possessed WMD and terrorist groups been prevalent in Iraq as the Bush administration so loudly asserted, U.S. forces might well have failed to prevent the WMD from being spirited out of the country and falling into the hands of the dark forces the administration had declared war against." In the end, Secretary of State Colin Powell and British Prime Minister Tony Blair persuaded President Bush that the U.S. needed to go to the U.N. to try to legitimize the invasion. Diplomatic efforts over the next few months allowed more time for war preparations and the final option embraced by Rumsfeld - Lt. Gen. David McKiernan's Cobra II - was closer to Generated Start, the original plan, than the various iterations that were subsequently developed and are reflected in the declassified PowerPoint slides. "It's quite frustrating the way this works, but the way we do things nowadays is combatant commanders brief their products in PowerPoint up in Washington to OSD and Secretary of Defense... In lieu of an order, or a frag [fragmentary] order, or plan, you get a set of PowerPoint slides... [T]hat is frustrating, because nobody wants to plan against PowerPoint slides." "Here may be the clearest manifestation of OSD's [Office of Secretary of Defense] contempt for the accumulated wisdom of the military profession and of the assumption among forward thinkers that technology -- above all information technology -- has rendered obsolete the conventions traditionally governing the preparation and conduct of war. To imagine that PowerPoint slides can substitute for such means is really the height of recklessness." National Security Archive senior analyst Joyce Battle asked the U.S. Army under the FOIA in 2004 for documents related to the 2001-2003 debates over troop levels for the Iraq war. In response, the Army referred the request to Central Command in 2005; and CentCom responded to the FOIA request in January 2007 with the declassified PowerPoint slides. The slides were compiled at CentCom with tabs labeled "A" through "L" (one slide is unlabeled). 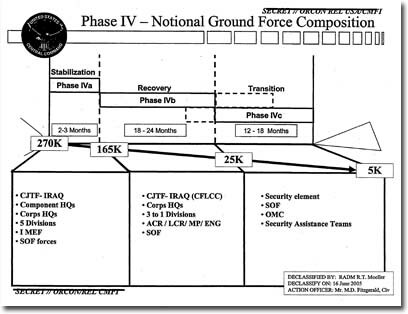 The Web posting today reproduces the documents as they were released by CentCom, together with additional items prepared by the National Security Archive: a brief chronology of Iraq war planning based on secondary sources, a glossary of military acronyms (essential for translating the otherwise cryptic references on the slides), and an introduction written by Ms. Battle. November 21, 2001 - President Bush asks Defense Secretary Rumsfeld about contingencies for war with Iraq, and directs him to initiate planning. November 26, 2001 - Rumsfeld meets with Gen. Franks at CentCom headquarters in Tampa and they review the existing operating plan, OPLAN 1003. December 1, 2001 - Rumsfeld asks Franks to develop a commander's estimate as the basis for a new war plan. December 4, 2001 - Franks presents a video conference for Rumsfeld on his commander's estimate, outlining robust, reduced, and unilateral plans based on levels of regional support (see Tab A). December 28, 2001 - Gen. Franks briefs President Bush at Crawford on the commander's estimate calling for an invasion force of 275,000 troops. January 29, 2002 - President Bush targets Iraq in his "axis of evil" State of the Union speech. February 1, 2002 - Gen. Franks presents Generated Start, a plan building to 275,000 troops, to Rumsfeld at the Pentagon. March 3, 2002 - Gen. Franks briefs President Bush again on Generated Start, but there is pressure from Rumsfeld to reduce troop levels. March 10, 2002 - Vice President Cheney begins a Middle East tour seeking support from friendly governments for the invasion of Iraq. March 21, 2002 - Gen. Franks meets with commanders at Ramstein, Germany on planning that still calls for 5 and 2/3rds divisions but emphasizes a faster march to Baghdad. March 29, 2002 - Gen. Franks briefs the Joint Chiefs of Staff. April 20, 2002 - Gen. Franks briefs President Bush at Camp David on planning, calling for war to begin with 180,000 troops, ramping up to 250,000. April 20, 2002 - A PowerPoint slide on "Phase I Operations" lists the following, among other steps: 1) Secure international/regional support; 2) Posture forces for offensive operations; 3) Enhance intelligence and targeting; 4) Degrade and deceive Iraqi regime; 5) Deter Iraqi internal and external operations; 6) Prepare Iraqi opposition groups for action (see Tab D). 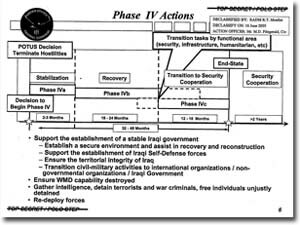 May 10, 2002 - PowerPoint slides on a "Compartmented Plan Update" summarize several matters: timing; "enabling actions" for war, including continuing "OGA [CIA] covert action" in U.S.-controlled northern Iraq "which started 4-5 months earlier," "post-regime government strategy," and "strategic information operations;" force deployment; and Phase IV (post-conflict) actions, including "ensure the territorial integrity of Iraq," The expected duration of Phase IV: months (see Tab C). May 11, 2002 - Gen. Franks presents the "Running Start" plan to Bush at Camp David, speeding up the invasion, using "Red, White, and Blue air strike plans" as a bridge to war, launching with only one Marine Expeditionary Unit and 2 Army brigades or, maximum version, two divisions. June 19, 2002 - Gen. Franks briefs President Bush again on Generated Start and discusses ongoing work on Running Start. June 27-28, 2002 - Gen. Franks tells his commanders at Ramstein to focus on Running Start because of the administration's impatience. August 1-2, 2002 - Gen. Franks meets his commanders at Tampa and tells them they need to be prepared to attack Iraq immediately if so ordered. But there are concerns that Running Start will result in a larger number of U.S. casualties. August 4, 2002 - PowerPoint slides on "Compartmented Concept Update 4 Aug 2002" summarize the Generated Start plan, the Running Start plan, a Modified plan, and Phase IV actions, including "Establish a secure environment and assist in recovery and reconstruction" and "free individuals unjustly detained" (see Tab L). August 5, 2002 - Gen. Franks briefs the president and the NSC on war planning (see Tab K and Tab L), and discusses the Hybrid concept. According to Gordon/Trainor, "it was a hit at the White House," though Franks saw that Secretary of State Colin Powell had doubts. Powell later called Franks to express his concern about force levels. August 14, 2002 - Gen. Franks and Maj. Gen. Gene Renuart meet with Rumsfeld and update him on the Hybrid option. 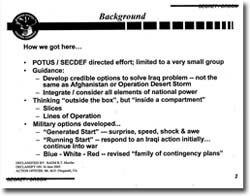 August 15, 2002 - PowerPoint slides on "Compartmented Planning Effort 15 August 2002" (Tab I) provide background on planning, noting "POTUS/SECDEF directed effort; limited to a very small group . . . Integrate / consider all elements of national power . . . Thinking 'outside the box', but 'inside a compartment'." 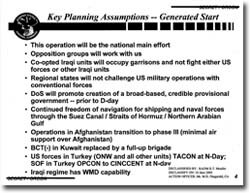 "Key Planning Assumptions" for Generated Start included "DoS will promote creation of a broad-based, credible provisional government - prior to D-day" [invasion], and "Iraqi regime has WMD capability." August 26, 2002 - Vice President Cheney speaks to the Veterans of Foreign Wars targeting Iraq. March 20, 2003 - The U.S. invades Iraq. 1. William M. Arkin, Code Names: Deciphering US Military War Plans, Programs, and Operations in the 9/11 World, (Hanover, NH: Steerforth Press, 2005), pp. 1-2.